In an effort to better understand the career opportunities for students, school instructors have been engaging in the national trend of partnering with established legacy employers within their communities. As a supporter of STEM education, Strongwell has been one of the corporate sponsors of a local VEX IQ robot team. Lori Givney, one of the CTE (Career and Technical Education) instructors from Tennessee High School, recently invited Strongwell to present how engineering is vital for material sciences and how manufacturers impact community growth. 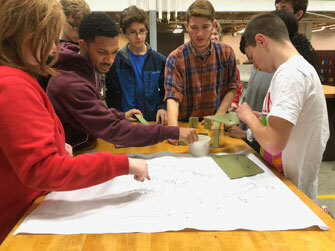 Strongwell presented its history, products, markets, and applications to two of Ms. Givney’s Intro to Engineering classes. The topics covered included: how fiber reinforced plastics are designed, manufactured, fabricated, and assembled into market material applications within specific structures throughout the world. Throughout the presentation, students noted questions regarding the issues of transportation, shipping, logistics, assembly, skilled labor, and tariffs. 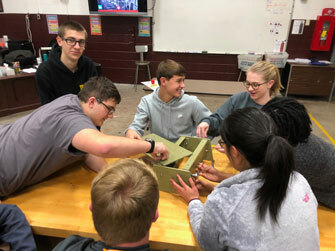 To encourage further product interaction, Strongwell introduced a timed hands-on activity where two teams of students assembled and disassembled an industrial composite stepstool fabricated with EXTREN® pultruded structural shapes and plates. Students were also given opportunities to analyze and implement process overhauls to yield assembly efficiency and quality gains. Strongwell would like to extend our thanks to community educators and students for their interest within the manufacturing sector.